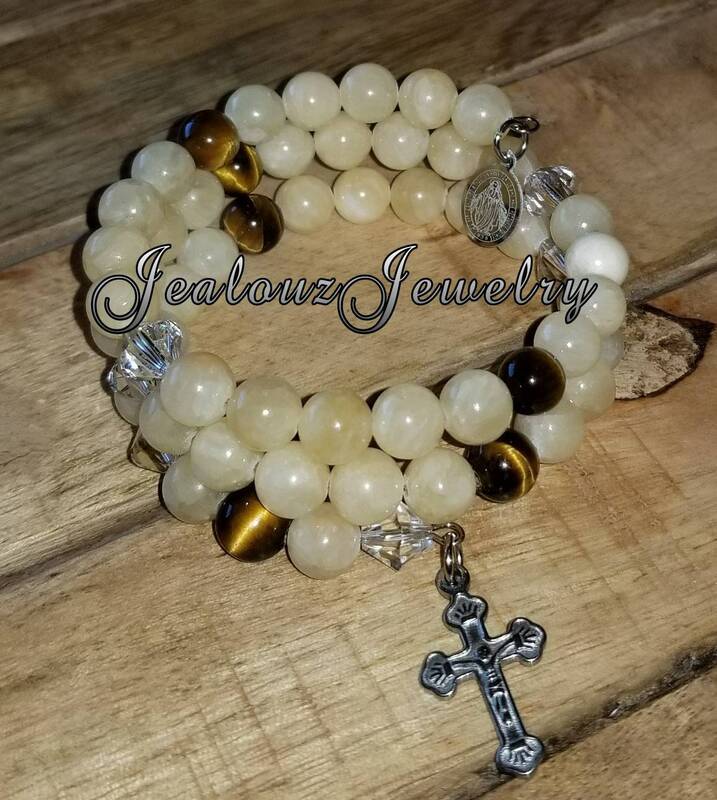 You Are Buying A Handmade High Quality 8mm Gemstone Beaded Stainless Steel Memory Wire Wrap Around Rosary Bracelet Made With Love And Positive Energy! This Bracelet symbolizes Powerful Healing, Protection and Strength! Yellow Jade Crystal Healing Properties.Yellow jade is believed to aid a poor digestion. When used close to the body,Yellow Jade is thought to provide protection from one's enemies and can be used to protect one on long journeys. Also to attract good luck, for wisdom, for long life and a peaceful death. Jade Healing Properties. ... A protective stone, Jade keeps the wearer from harm and brings harmony. Jade attracts good luck and friendship. It stabilises the personality and promotes self-sufficiency. Soothes the mind, releasing negative thoughts. Tigers Eye Stone is a crystal with lovely bands of yellow-golden color through it. This is a powerful stone that helps you to release fear and anxiety and aids harmony and balance. It stimulates taking action, and helps you to make decisions with discernment and understanding, and unclouded by your emotions. I thank you for your interest in admiring my bracelets! Bracelet Will Come With A Gift Box! Enjoy!